Out of the Past (1947) is considered one of the best of the 1940s film noirs. In spite of the acclaim the film has received from critics, it’s not as well known as Double Indemnity (1944) or The Postman Always Rings Twice (1946), but it can easily hold its own next to those two classics. Directed by Jacques Tourneur, Out of the Past showcases the director at the top of his game. 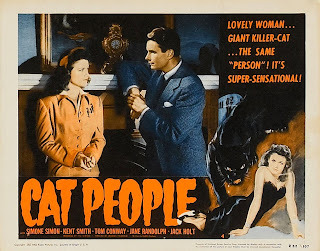 Tourneur started out as a unit director working for David O. Selznick where he met fellow Selznick employee Val Lewton. Lewton worked on many of Selznick’s prestige productions including A Tale of Two Cities (1935) and Gone With The Wind (1939). The two became friends and when Lewton was put in charge of the newly formed horror unit at RKO, he convinced Tourneur to join him. Together they crafted some of the most famous and successful horror movies ever produced. Before the term film noir was coined, these horror films incorporated some of the elements that we have come to identify with the genre. In the three horror films Tourneur directed for Lewton, you see wonderful shadows, interesting camera angles, and creative use of sound to create a mood and stir the emotions. Out of the Past gave Robert Mitchum one of his first important roles as a leading man. It also helped identify him as a movie tough guy, a reputation that would follow him for the rest of his career. This was also an important film for the leading lady, Jane Greer. Discovered by Howard Hughes, Greer was only 23 when the film was released. As femme fatales go, Greer is at the top of the heap. With her cool sensual beauty, it’s easy to see how she could handle a man like Mitchum. Like many film noirs, a lot of the story is told in flashback. And like many noir plots, it does get complicated at times. Plot complexities aside, it’s the motivation of the characters that makes this film fascinating. The line between good and evil is a fine one in Out of the Past. As far as the direction goes, New York Times film critic Bosley Crowther noted Tourneur’s “smooth realistic style” in his November 26, 1947 review. The plot concerns Mitchum’s character Jeff Bailey, a former private eye trying to escape his questionable past. But the past catches up with him and he’s drawn back into a life he’d like to forget. Greer plays Kathie Moffet, a woman from Jeff’s past who is trying to break free of the clutches of her abusive boyfriend, Whit Sterling, convincingly played by Kirk Douglas in only his second film. Kathie, who earlier had an affair with Jeff, tries to manipulate him into helping her run away from Whit. Jeff, still attracted to Kathie allows himself to be manipulated, thinking he’s smart enough to come out okay. It’s this conceit that is his downfall. 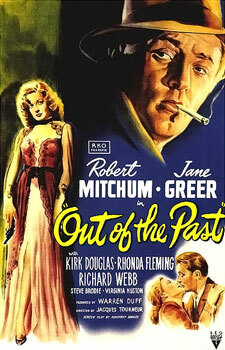 Out of the Past features great performances paired with beautiful cinematography, snappy dialogue, and fluid direction. You’ll enjoy the ride; I guarantee it! Check out the updated trailer below, featuring “Baby, Please Don’t Leave Me” by Chicago’s own, Buddy Guy. If you love classic cinema, you should join the Chicago Film Club. It’s free to join. Come share your love of the movies; it’s fun! The Daystar Center located at 1550 S. State St. works through a grassroots network of collaborations and partnerships with individuals and other nonprofit organizations. Through this web, they’re able to provide educational, cultural, and civic activities that enrich and empower their clients, guests, and community members. To learn more about classes and events offered at the Daystar Center, please visit their Web site. Oh boy - I would love to see this on the big screen! Such a fantastic film. It was great fun. Wonderful group discussion afterward. The next film series will focus on screwball comedy.